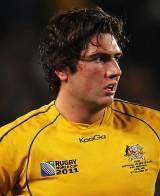 Simmons was called into the Wallabies side for his debut during the 2010 Tri-Nations. He made his first four appearances from the bench but pushed on and started during their tour of the northern hemisphere during November. Simmons had a hugely successful campaign with the Reds during the 2011 Super Rugby season, which ended in the Queensland franchise taking the trophy. Simmons then went onto play in the Wallabies' first two matches of the 2011 Tri-Nations amid strong competition from James Horwill, Nathan Sharpe and Dan Vickerman. Simmons was a member of the Wallabies squad that reached the semi-finals of the Rugby World Cup later that year and agreed a new contract with the Reds and Australia early in 2012.